Fall is my favorite time of the year. I love all of the trees bursting into flaming orange and reds. I love running on those brisk cool days. I also love cooking up all the seasonal dishes. 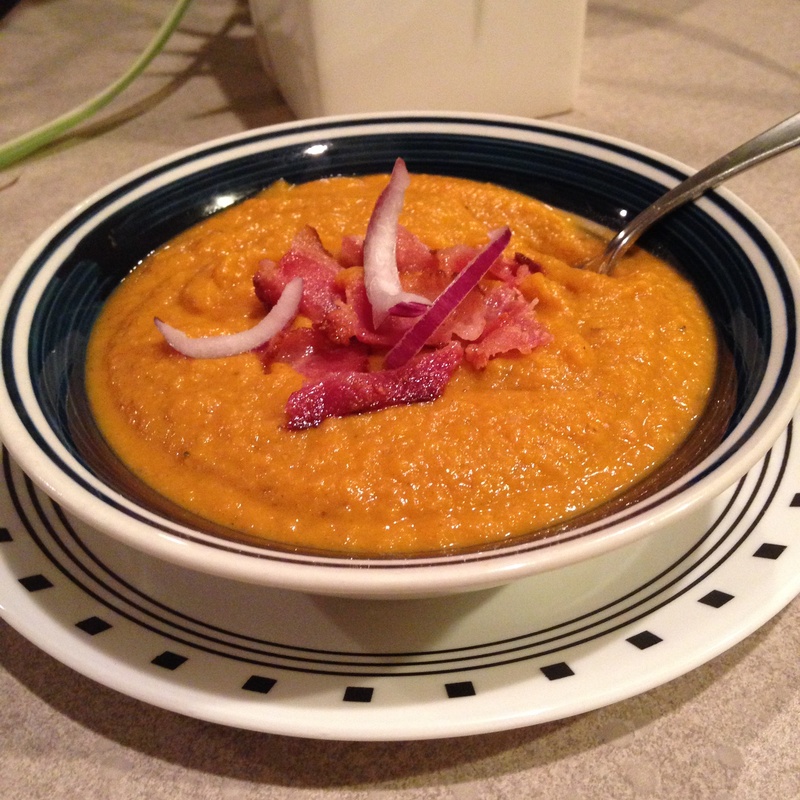 I have been doing a lot of experimenting lately on different types of soup that can be made using squash. Although this isn’t my favorite type of soup, it still puts me in the fall spirit. I think this recipe would be perfect on a chilly fall day next to a steaming fire. Slice open squash and scrape out all of the seeds in the squash. Bake on a cookie sheet lined with parchment paper at 350 for 45 minutes or until the squash is soft. Allow Squash to cool. The skin of the squash should be able to pull off easily. Cut Squash into cubes. I usually like to do this step a day before starting my soup recipe. Finely chop onions and bacon and add them to a kettle. Allow bacon and onions to simmer for 10 minutes or until the onions are translucent. Add mushrooms, tomatoes and squash to the kettle. Add water and pepper and allow soup to simmer for 20 minutes. Add mixture to a nutribullet, vitamix, or other type of blender and serve. Hi Casey, this looks great! I’ve been thinking about eventually doing soup with the vitamix and this may be my first recipe to try. Thanks.